Ah yes, give me the simple life. Well, I’ll at least try for basic and simple and part of that, I believe, is black and white photography. I have shot black and white film of sports and high school and landscape and weddings. My first attempt at venturing off the beaten path of black and white was to use a graphic arts film for pictorial results. Technical Pan was the film and I don’t recall the developer but I do remember the results were near grainless with detail where there shouldn’t have been detail. Now digital! Yeah Digital! Smiling Car #70009. Near LaGrange Tennessee with Nikon D750 and Nikkor 20-35mm f2.8 at f8 and 35mm. Shutter Speed:1/400 and ISO: 100. Nothing is like the potential that we have with digital. I know there are workflows that capture as a black and white but for me the framable possibilities are better by capturing in color. It’s like reliving the shooting experience. Perfecting the image can be done at the time of editing where, in the past, it had to happen while shooting. Let me share some detail to make my point. In a shooting environment if you saw a light blue sky and needed it darker a yellow filter could be added to the front of your lens. The rule for that is: Yellow filter when shooting black and white will lighten its own color and darken its opposite…..blue. NOW if we’ve shot a color original we can darken the light blue sky in our editing. Lightroom rocks. 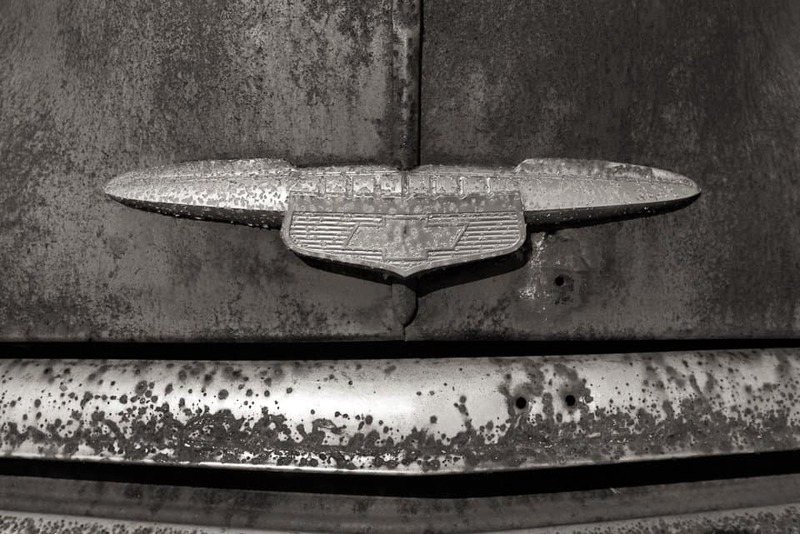 When shooting a rusty red classic car we can adjust the red tone in the black and white adjustments of Lightroom. Take a minute and let me know the color of the filter to place over your lens to darken the red rusty car in black and white. While studying the color wheel enjoy the video with the detail of “Making a Black and White in Lightroom”. There is so much at our fingertips to create exceptional images, this is one small, simple technique. Keep an eye out for more. So much of what we do in editing and preparing photos is done based on the visual that is our display. Is your display the same color as the rest of the planet? Probably NOT. Is it calibrated? Setting the black and white point doesn’t take from your ability to create. It allows others to enjoy your creation equally. It’s not a must do. My suggestion, like here on the video about Smiling Car, is to determine the point using the option key to determine the point which whites bow out or blacks block up and then adjust to taste. The blacks are very dark shadows so I let them go extra black. The highlights need to be protected so I stay closer to what I’ve discovered using the option mask. Consider when darkening a sky. We know it’s blue so first consideration is to move the blue slider to darken. Try using the targeted selection tool and you may find that the blue sky actually has a component of aqua. Also the selection tool can adjust all the tones in one photo without clicking or hitting enter and can even move from photo to photo when you have numerous photos to adjust. So, like in Smiling Car, use this tool for more specific adjustments. The main thing to learn about split toning is that, in Lightroom, that is the place to reintroduce color to your black and white images. My approach is subtle but feel free to go crazy with bold and beautiful colors, if you prefer. I’ll stick with my slight bit of warmth and occasional cool tone. Normally, I’d be preaching the sermon of correcting the lens weaknesses with the strength of a quality profile. Do it. But here I’m using an exceptional Nikkor 20-35mm f2.8 lens and it is older. Replaced with the 17-35mm f2.8. Some of the older lenses are not available in the Lighroom collection of profiles. So, better not to use any than one not made for the lens. You may think of getting a close match but realize the profile is closely tied to a specific profile. Don’t. Why Start at the Bottom? After prepping and editing many photographs and leaving out the profile selection I’ve found it much better to start with the profile. To adjust contrast and density and all the things available and then selecting the preferred profile, realizing that I probably don’t need a profile at that point. I am choosing a profile early in the process and sometimes in my import preset. Portraits are assigned Camera Portrait and landscape is assigned Vivid. Commercial work comes in with Camera Vivid or Camera Neutral. Raw files are awesome and they are superhuman in the ability to retain detail in the shadows and highlights. The bad side of this is that all that detail can make a flat appearance in your image. This is a reason some folks stay with Jpegs. They are snappier. That snap is a product of a the Jpeg profile so I just select a profile (when with Jpegs nobody asks you for a profile preference). Another way of looking at it is to make a similar choice as committing to a film. Landscape shooters love Fuji Velvia so try Vivid as profile. Portrait shooters needed a softer contrast so negative films like Portra and Fujicolor Pro. Stick with Camera Portrait. So YES, camera profiles can help you achieve that film look. Well, at least it’s a start. Watch the video in its entirety and make use of these stamps to refer back to the details as needed. Visit the TEKeez Library. Check out anything you like. Permanently. Yours to keep. Stay connected and know all the happenings of TEKeez. Thanks and Enjoy. Success! Thank you! Now check your email to confirm your subscription.